Home Strange Stories Obama to make UFO Alien disclouser soon ? 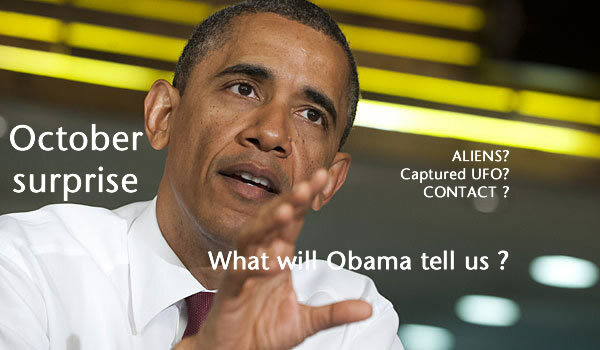 Obama to make UFO Alien disclouser soon ? What will President Obama tell us this year about Aliens and UFO’s? as the race for the white house steps up? Many suggest the October Surprise will be Alien Disclosuer! UFO disclosure is not an easy subject for many Governments around the world, although it is true that the Mexican Government is actively seeking an answer to what exactly is going on in the skies of Mexico. Just what are the objects that keep buzzing aircraft and illuminating the atmosphere? Analyzing President Obama’s statement you would be forgiven for thinking that the Government would actually put up a veil of secrets if Extraterrestrials are not very friendly. 1. The Obama Administration does actually know of life beyond our planet, but we need to have a secure and peaceful planet before any disclosure is made – this could be at the request of ET. 2. There is no hard evidence although if and when contact is made he will actually say something. There is a lot of speculation that President Obama is going to make an announcement in 2013 as was in 2012 with regards to disclosure that the Earth has indeed been visited by Alien life for a great many years. It is also widely tipped that UFO disclosure is going to be very subtle and has been during 2011 and 2012, and may even go unnoticed by many people in 2013. There are many reasons why disclosure of UFO’s and Aliens would have to be gradual and subtle, one of those is the fear that religion (a mainstay of the global economy) would not be able to explain or answer to its following. How does religion explain life other than on Earth? It can’t without backtracking on its fundamental principles. It seems that once such religious issues have been addressed, then Alien Disclosure will in fact be there for everyone to mull over. President Obama’s disclosure statement either very well edited or at full on face value is an interesting and debatable subject. It is becoming increasingly apparent that the NSA, NASA, CIA, FBI and the US Government do actually know more than what they are saying. You only have to read archived journals, newspapers, internet articles and watch a multitude of videos on YouTube to see plainly something is going on.